After 16 Months, Trump Names An Ambassador To South Korea : The Two-Way Adm. Harry Harris is the head of the U.S. Pacific Command and is known for his hawkish views on North Korea and China. His nomination comes amid the ongoing drama on the Korean Peninsula. 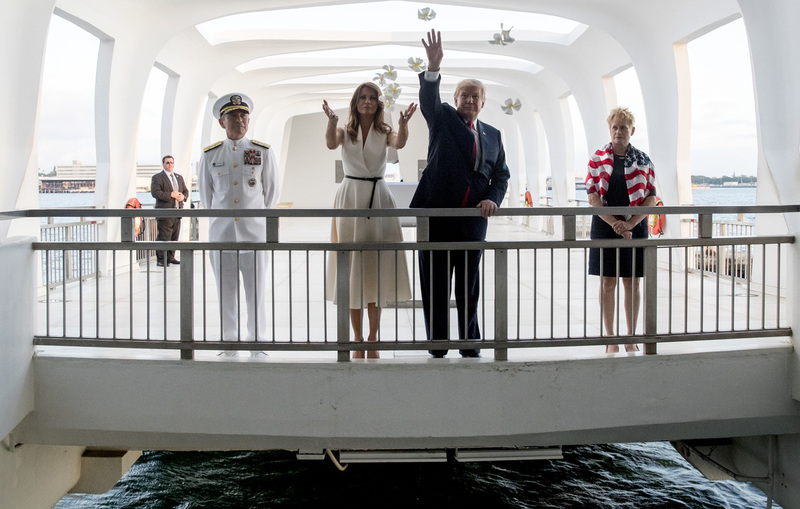 President Trump and first lady Melania Trump, accompanied by Adm. Harry Harris (left) and his wife, Bruni Bradley, throw flower pedals while visiting the Pearl Harbor Memorial in Honolulu, Hawaii, last Nov. 3. Trump has nominated Harris to be the U.S. ambassador to South Korea. The president signaled his intention to select Harris in recent weeks. But the formal nomination didn't come until late Wednesday, less than a day before Trump's Thursday morning announcement that he'd called off the planned June 12 summit with North Korean leader Kim Jong Un. Harris is the head of the U.S. Pacific Command, making him the top military officer responsible for Asia and the Pacific, and he's known for his hawkish views on North Korea and China. He appeared before the Senate Armed Services Committee in March and was asked about the prospects of a Trump-Kim meeting. "I think we can't be overly optimistic on outcomes. We'll just have to see where it goes if and when we have the summit," Harris said. "North Korea remains our most urgent security threat in the region," he told the senators. "This past year has seen rapid and comprehensive improvement in North Korea's ballistic missile and nuclear capabilities despite broad international condemnation and the imposition of additional United Nations security resolutions." The Trump administration had come under mounting criticism for not filling the ambassador's post sooner amid the ongoing dramas on the Korean peninsula. Dozens of ambassadorships remain empty and the South Korean post was considered particularly important. The U.S. works closely with South Korea on military, diplomatic and economic matters. Nearly 30,000 U.S. troops are stationed in South Korea and the two countries have been deeply engaged in developing an approach to North Korea. The U.S. has never had diplomatic relations with North Korea. At the beginning of the year, Trump appeared likely to select Victor Cha, a former member of the National Security Council, to be the envoy to South Korea. But the administration was engaged in a war of words with North Korea, with some officials suggesting a limited, pre-emptive military strike, the so-called "bloody nose" option. Cha disagreed and eventually wrote an opinion piece in The Washington Post. "Force will be necessary to deal with North Korea if it attacks first, but not through a preventive strike that could start a nuclear war," he wrote. "An alternative coercive strategy involves enhanced and sustained U.S., regional and global pressure on Pyongyang to denuclearize." Trump nominated Harris in February to be the ambassador to Australia before changing his mind and selecting the admiral for the South Korea post.